Metallica launched the North American leg of their WorldWired tour in support of “Hardwired…To Self-Destruct” at M&T Bank Stadium in Baltimore, MD on May 10, and video from the event has surfaced online. Metallica were joined by openers Avenged Sevenfold and Volbeat alongside DJ sets by Mix Master Mike. Metallica are sharing a “Thank you Baltimore” video montage featuring footage around the city, fans gathering for the show, and a look inside the stadium as the group hit the stage. The summer 2017 run marks Metallica’s first run across the continent in eight years as they tour behind “Hardwired…”; last month, the project achieved platinum status in the US for sales of 1 million copies. 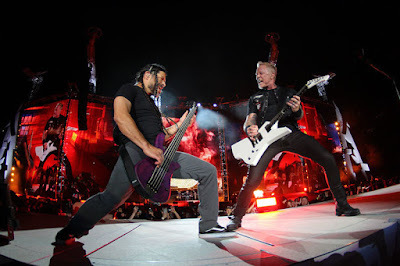 Metallica continue the trip this week with shows at Lincoln Financial Field in Philadelphia, PA on May 12 and at MetLife Stadium in East Rutherford, NJ on May 14.